Brief sketching of the developing revolution within the German states, particularly Frankfurt and Berlin. 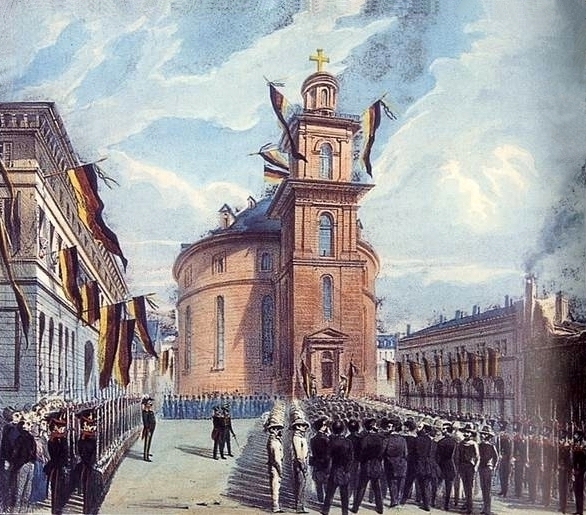 The political crisis during the German revolution of 1848/49 once again intensified after March 1848 due to the clashes between revolution and counter-revolution. The crisis was set off by a conflict between the Prussian crown and the Berlin Constituent assembly because of the demand for the dismissal of reactionary officers and the attitude of the Frankfurt National Assembly to the armistice of Malmo in the German-Danish war over Schleswig-Holstein. Popular demonstrations in wide regions of Germany and scattered upheavals turned against the emergence of counter-revolutionary forces, and, in continuing the revolution, they sought to fulfil their longstanding social and political demands. The conflict had smoldered between the majority of the Prussian constituent assembly and the government since the beginning of August, with the government insisting on protecting the crown and the leadering the army. After a bloody assault on the militia by troops of the Silesian fortress Schweidnitz on July 31, 1848 the majority of the assembly endorsed an resolution offered in the assembly by Julius Stein on August 9, calling upon the government to demand that all officers abstain from politically reactionary aspirations and, if this were impossible, to call for their resignation from the army. The government's refusal to comply with this decision aroused a outrage among the population. Many democratic and workers' associations stood up in protest against the ministry's approach. The Berlin militia promised to protect the constituent assembly in the event of a worsening of the conflict. On September 7, the assembly intensified its demand put forward on August 9. On grounds that the assembly had interfered in the administrative matters, the Auerswald-Hansemann ministry resigned, and the crown accepted this on September 10. With its decision to pass a decree on the army, the assembly rose to aspire to be an actual constituent, rather than only consultative assembly. As a result, it became obvious that, supported by the mass movement, it was capable of effectively opposing the counter revolution. Parallel with the domestic political crisis in Prussia, a protest movement developed in most other German states in response to the armistice treaty signed between Denmark and Prussia in Malmö on August 26, 1848 and to the attitude of the Frankfurt national assembly toward this treaty. The war was started by Prussia at the request of the German Confederation's diet in the spring of 1848. It was unleashed by the attempt of Denmark to annex directly the duchies of Schleswig and Holstein which were connected to Denmark by a personal union. Due to the increasingly national enthusiasm which Germans responded to this war, Prussia took a more restrained approach. Under Russian and British diplomatic pressure, Prussia at the end of May had pulled back its troops from Jutland and then, without the consent of the Reich ministry in Frankfurt, concluded the armistice of Malmo. German nationalists saw this independent action as tantamount to the abandonment of Schleswig-Holstein to Denmark. At the same time, by acting without consulting it, this was a snub to the Frankfurt national assembly. The national assembly on September 8 initially rejected the armistice of Malmö; then, it reconsidered its hasty action on September 16 and accepted the treaty by a narrow majority in a second vote. Thus the national assembly backed down in the face of Prussia. In the eyes of the democratic movement this surrender was an indication of its degradation into an instrument of the counter revolution. In the popular movement of September 1848 democratic, anti-Prussian, and national political demands became intertwined with the social complaints and aspirations. In large regions of Germany, such as Silesia, Saxony, and Bavaria, the attempts of the landowners to collect the levies and taxes denied to them since March set off new unrest among the rural population. In the Saxon town if Chemnitz a protest movement by workers on September 12 turned into an attempted revolt. A mass demonstration in Neustrelitz forced the Grand Duke of Mecklenburg-Strelitz to dismiss his reactionary ministers. Due to the turmoil in wide regions of Thuringia, the Reich ministry delegated a commissioner to act with Saxon, Bavarian and Hanoverian military. The left-liberal member of the Prussian constituent assembly, Hans Victor von Unruh, described the situation on September 7 pointedly with the following words: "At this moment we are between a counter-revolution and a second revolution." Thus, it became indispensable in the eyes of democrats and wide sections of the people to have a second revolution in order to finally crush the re-emerging reaction and to safeguard the achievements of March as well as to press for thorough-going political and social demands. At a meeting at Worringen in the Rhineland on September 10 attended by more than 10,000 people and elsewhere, the call for a "democratic-social" or "Red Republic" was heard. The armed popular uprising in Frankfurt am Main on September 18 was an major event in the September crisis. In protesting against the majority of the national assembly's approval of the armistice of Malmö on September 16, a popular assembly of about 15,000 participants convened by the democratic and the workers' association in Frankfurt on September 17 demanded that the left withdraw from the national assembly and to constitute a revolutionary counter-parliament. On September 18 an unarmed crowd of people wanted to enter the St. Pauls Church, the conference hall of the national assembly, in order to gain its attention. The Prussian and Austrian troops, which were called in by the Reich ministry from the nearby fortress Mainz, attacked the crowd, inciting a street battle which went on for several hours. Workers and gymnasts (Turners) of Frankfurt who were supported by democrats from Offenbach and Hanau entrenched themselves in the old part of the town behind some 40 barricades and armed themselves when they stormed the armory. Part of the town militia of Frankfurt stood on their side. But the approximately thousand participants in the armed uprising were unable to withstand the superior strength of the military. A state of siege was imposed on the town. By the end of September an attempt at revolt was also made by petty-bourgeoisie democrats. On September 21, in Lörrach, Gustav v Struve proclaimed the "German Republic" and put himself at the top of a "provisional government of Germany." All feudal burdens, the debts of farmers resulting from amortization, and all taxes and contributions to the state and the Church were declared to be rescinded. Landed property of the state, the church, and the reactionary great landowners were to be transferred to the communes. The uprising, which was only supported by several columns of volunteers and militia, began to break down in the first clash with regular government troops of Baden. The crisis of September did not bring about a substantial change in the relationship of forces that had emerged with the March revolution in the infighting between social groupings. The revolutionary uprising and the ensuing counter-revolutionary storming of Vienna in October in conjunction with the coup d'etat in Prussia by the end of November/beginning of December were of overriding importance for the further course of the revolution. Becker, Gerhard. "Die Septemberkrisen", in Walter Schmidt Deutsche Geschichte, Berlin 1984, IV. Real, Willy. Die Revolution in Baden 1848/49, Stuttgart 1983. Valentin, Veit. Geschichte der deutschen Revolution von 1848-49, Berlin 1931. _______. Frankfurt am Main und die Revolution von 1848-49, Stuttgart and Berlin 1908. Wendel, Hermann. Frankfurt am Main von der grossen Revolution bis zur Revolution von oben (1789-1866), Frankfurt/Main 1910.